Introduction: How many of you have a love hate relationship with your spinning tackle centered around that one, seemingly unavoidable malady - line twist? 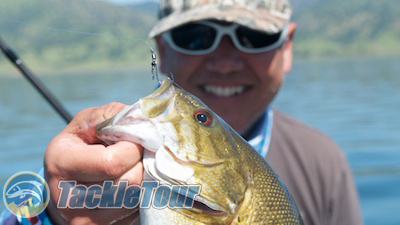 Do you spend time between casts letting your bait hang freely and spin out of the twist? 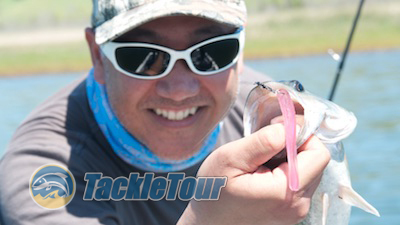 Several years ago, Gamakatsu with the help of pro staffer Shin Fukae came out with an innovative little design to help drop shot fishermen minimize line twist problems. It took us some time, but finally, here is our look at the Swivel Shot Drop Shot Hook. Impressions: We first caught wind of Gamakatsu's plans to debut their Swivel Shot hook back in 2011 but for whatever reason, it took a while for the manufacturer to finally make the product available. In the interim, other manufacturers came out with competing products, but we held out to test the one we saw first. Gamakatsu's Swivel Shot is available in a drop shot style hook as well as an octopus style (pictured). There are now actually two Swivel Shot hooks available from Gamakatsu for drop shotting. One is the original Swivel Shot built with an octopus style hook, the other is the new, drop shot specific hook with a nano-coating finish. 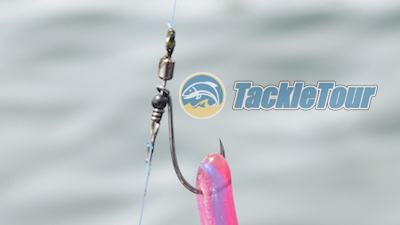 We've fished both though most of the photos in this review will be of the original octopus style hook. Rigged and ready to go with a Roboworm straight tail. Real World Tests: The biggest challenge for any finesse fisherman when seeing this product on the store shelf will be getting your thoughts past all the hardware associated with this tiny little hook. Many, like our own Editor in Chief, Zander, will have a hard time getting past the feeling that the added swivel hardware may hurt the chances of getting a bite. This smallie didn't seem to mind the extra hardware around the hook. Rigging: The best way to find out of course, is to tie one on, toss it out, and crank up some drop shot fish and that's exactly what we did on a few of our testing trips. Zander would fish a standard rig and I'd fish the Swivel Shot while both using the same line and bait. I really like how easily you can adjust the weight leader without having to retie everything. One benefit of the swivel shot, other than reducing the occurrence of line twist is that line clip at the bottom of the swivel. This little clip allows you to adjust the length of your leader up or down without having to retie. It's great for making adjustments on the fly. 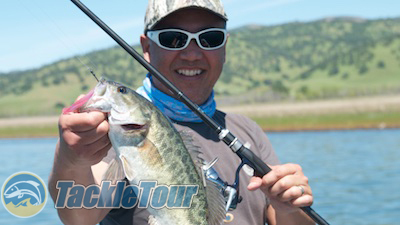 Out testing with some Spots on Lake Berryessa matched to a G-Rods International spinning rod and my trusty Daiwa Certate. Effectiveness: Once you get down to fishing, I noticed no difference in terms of catch rate between Zander and myself. We always seemed to be within a few fish of each other and much to his chagrin, and I usually ended up with the kicker fish at the end to close things out! 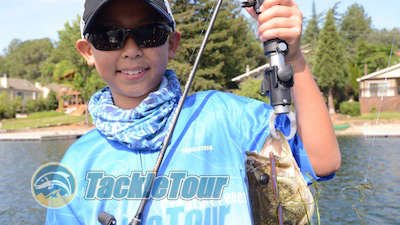 Even though my son is using a casting rod in this picture, the Swivel Shot is a great hook to use with kids #1 because it helps with line twist but #2 it allows you to adjust your leader length quickly so you can get them back in the water asap. Durability: A great thing about the Swivel Shot Drop Shot hook is it comes with that nano-coat finish that increases your hook up ratio and helps extend the life of the hook's needlepoint tip. I seem to be better at losing or misplacing these hooks than I am wearing them out. Certainly the swivels and line clips at the bottom of the swivel hold up extremely well too. Gamakatsu earns an Innovation award for their Swivel Shot hook! Price & Applications: The drop shot specific Swivel Shot retails for $6.99 per 3 pack while the original Swivel Shot retails for $5.99 per 3 pack. This breaks down to a $2.33 - $2.00 cost per hook depending on the model you choose which is pretty hefty for a drop shot hook. Conclusion: After our few trips testing with this hook, Zander finally came around to say he believes the swivel does not hurt your hook up chances - BUT he still can't wrap his head around to actually tying it on and using it in place of his proven setup. That's how it goes around here and that's why I'm the one writing the Swivel Shot up and not him. Does this device really help with line twist? 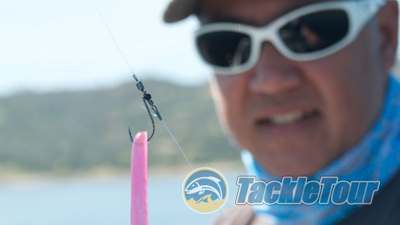 It certainly doesn't hurt and I'll take any advantage I can while using spinning tackle to reduce that line twist. Throw in that Nano-coating version and really, it's all good. If you want to help reduce the instance of line twist in your drop shot setup, you owe it to yourself to at least give this hook a try. 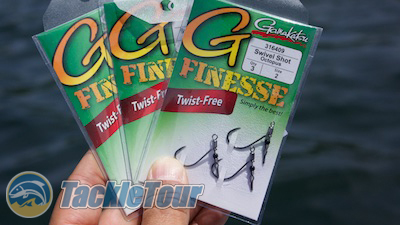 Looking for Gamakatsu Swivel Shot Hooks?